This is my herb garden @ My Cozy Corner. I love my herb garden. It sits right outside my back door. Winter, Spring, Summer or Fall I have herbs. I even turn on the porch light in the winter to cut some chives for my baked potato. I have two Aloe Vera plants in my herb garden. If someone has a bug bite or a little sunburn I cut a piece of Aloe Vera and rub it on the wound. All better!!! Tarragon and Thyme are perennials, and I trim them when they look tired. Yes, plants get tired too. As you can see there are plenty of herbs to use in any recipe. I live in a climate that has an occasional freeze each year. 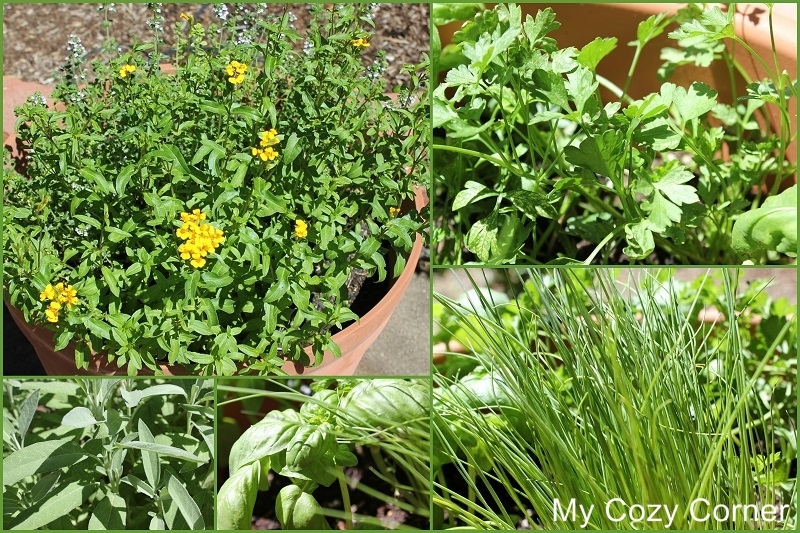 I don't cover the herbs in the winter, because most of herbs are perennial. BUT, THIS IS IMPORTANT...I USE PLASTIC POTS. TERRA COTTA POTS CRACK IF THEY FREEZE. I love basil, and I plant fresh basil each year. The first frost turns basil to a dark soft mess. I have planted four plants in one pot and I will have enough basil to make pesto and my favorite summer salad. Fresh garden tomatoes, fresh basil and mozzarella cheese and drizzle a little extra virgin olive oil with a sprinkling of salt and pepper. A very refreshing side dish. I have planted Barbeque Rosemary and oregano in one pot. The barbeque rosemary has straight stems that are sturdy enough to use as skewers for grilling. I love my Italian Parsley. If it starts to go to seed I just snip off the flowers and beautiful new tender stems grow from the bottom of the plant. The sage is a wonderful and versatile herb. I love the smell and the beautiful bush. Under the sage plant is mint. 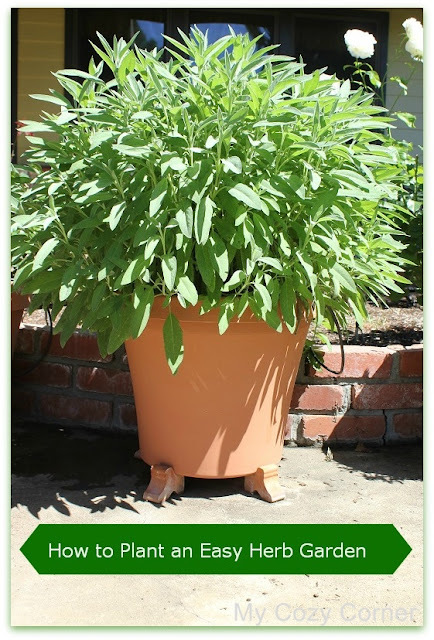 The mint doesn't spread very far contained in this pot with the sage. I have just enough mint to put in a pretty glass of iced tea. The chives are so delightful to have on hand. Just a snip or two and those baked potatoes covered with sour cream and chives are to die for. Also delicious on soups. This pot has basil, parsley and chives. The basil is small now, but it will be taller and wonderful when the fresh garden tomatoes are ripe in a few months. Now for the secret. Water, Water, Water. These plants are in a small container and they need water everyday. Especially in our hot climate. A small sprinkler goes into each pot that surround the large planter. The water is on a timer and goes on everyday all summer long. In the center of the planter are five of my most favorite roses.Every rose bush has a sprinkler and I have 13 pots that surround the planter and each pot has a small sprinkler inside. Well, I think I've given you an idea about how to plant a easy herb garden. If you have a smaller space, smaller pots will work just fine. The plants will need trimming a little more often, but you can bring the herbs into the kitchen and put them into a glass of water and they will be a bouquet garni. This is the view from my patio looking East. It's about nine in the morning, 85 degrees and no humidity. Hope you enjoyed your tutorial on How to Plant an Easy Herb Garden. I'm linking to your party. Thanks for the invite. I can see in your photos that you have tiny sprinklers and drip hoses? What kind of timer do you use? The timer for the pots and the rose garden are timed by a main 7 station sprinkler station. The timer on my fern grotto is a simple timer attached to the faucet with the drip system attached. The fern grotto is watered everyday for 15 minutes. Thanks for asking such a great question. Good Evening Betty, I love that you have told everyone, that if they live in a climate which has frost, to plant herbs in a plastic container, rather than a terracotta one. I live in a climate which freezes and I brought some beautiful terracotta pots from Cyprus.....totally forgot about the effect that frost has on terracotta and they all cracked.... I was so very disappointed. All your herbs look so very healthy.... there is nothing like cooking with fresh herbs. With the winters we get, I've always used plastic, and besides, it doesn't dry out as quickly as clay. I have a nice little garden and herb patch but as you say Betty, nothing like having everything just outside the kitchen door. I plan on planting more veggies in pots this year for a change as well. I have been growing basil each summer but added lavender and thyme recently. I had a gift of chocolate mint and it is growing like crazy. Good post. Did you plant from seed or seedling? Great question. I buy small plants and over the past years they have grown to be large plants. The two Aloe Vera plants are babies from a large mother plant I had for years. The rosemary plants I bought at the super market. Little plants make big plants. I love this post and pinned it. I am getting ready to tackle my herb garden. Your post came at the right time! This is one of my fave post of yours. Honestly, I started to do my herb pottings when it started to get warmer. I started to a smaller pots and when they grow bigger, I planned to re-plant them in a bigger pots. Stopping by from Foodie Friday, Love the pics of your herbs they are so healthy looking. My sister and I both love to garden, I get to do it year around and she has just the summer months. Enjoyed your blog. I enjoyed reading about your herb garden. I have a small raised bed herb garden. My mint is planted in pots in the ground...it still likes to spread so I have to keep an eye on it. Hi, hopped over from Fishtail Cottage. I love using my herbs to add flavor. I put a turkey breast in the crockpot this morning. Snipped a bit of Rosemary and sage from the garden and added to it. Having them handy in pots is a great idea. Mine is just out my back door and I like that also. I do keep my mints in above ground containers to keep it from being so invasive. Now a new follower.